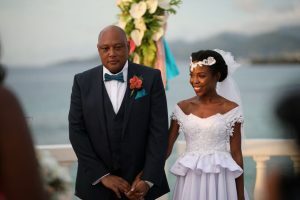 Minister of Natural Resources, Raphael Trotman tied the knot to Teresa Gaime on Saturday in Grenada. Gaime, the holder of two Masters Degrees, recently demitted office as his Technical Assistant at the Ministry of Natural Resources. She currently heads the consulting firm, Dochas Consulting. Gaime-Trotman is a former Deputy Director of Child Services at the Child Care and Protection Agency.